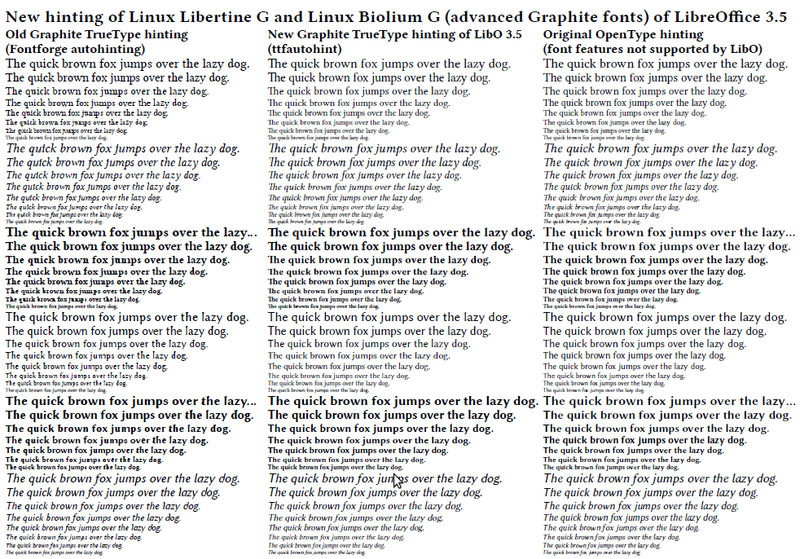 LibreOffice 3.5 has got extraordinary typographical capabilities with the improved Graphite port of the new versions of Linux Libertine and Linux Biolinum font families: new and improved font variants from Philipp Poll et al., like the excellent Linux Libertine Display G (true size variant of Linux Libertine for 16pt or more) and the new bold and semibold variants (see also LinuxLibertine.org); font features, like true small caps, old figures, ligatures, proportional numbers have been extended with proper combining diacritics for scientific texts and several languages, and with extended superiors (also true size variant) for typesetting of captions, footnotes, etc., see release notes/examples of the Graphite fonts. 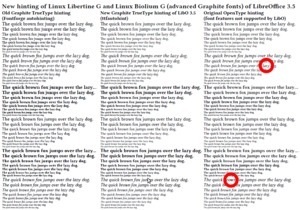 The main problem of the old versions of the Graphite TrueType fonts was the ugly hinting (the PostScript Type 2 hinting of the original OpenType fonts has been lost by transformation, and replaced by Fontforge autohinting). Fortunately (also thanks to the ttfautohint related article of Libre Graphics World editor Alexandre Prokoudine), I was be able to fix the hinting by the new FreeType tool ttfautohint, so Linux Libertine G and Biolinum G Graphite fonts of LibreOffice 3.5 are suitable for digital publishing, too. Moreover, ttfautohint gives better result in a few places, than the original OpenType hinting, see the bad space in the Linux Libertine Italic text “laz y”, or the bad “w” in the Biolinum Bold and Italic OpenType text. (Click on the picture to see the three different hintings in Adobe Reader on Linux). If you were not able to attend this presentation, please find the slides online. 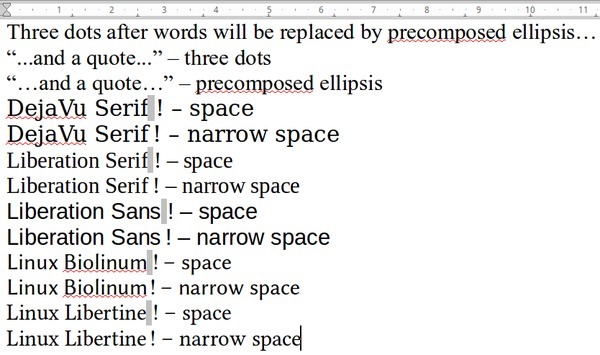 There are some really nice examples for the new InDesign-like typographical features of LibreOffice. Unfortunatelly, I was not able to attend the conference, so many thanks to András Tímár for the presentation.